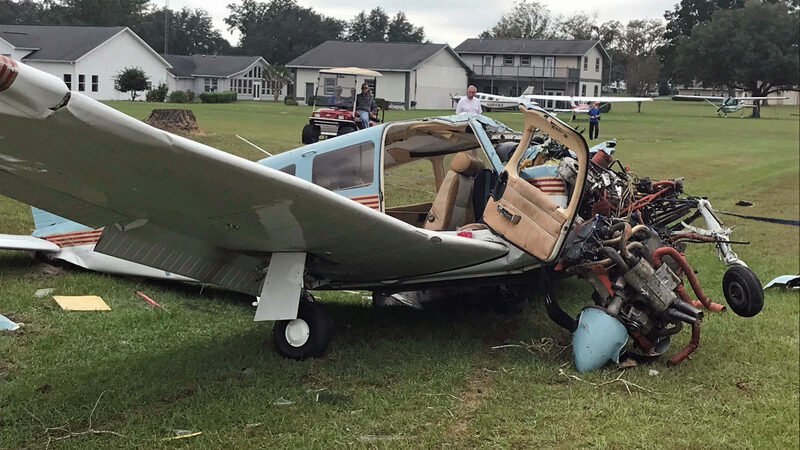 On November 11, 2018, about 1315 eastern standard time, a Piper PA-28R-201, N52737, was substantially damaged when it impacted terrain during the initial climb after takeoff from Cannon Creek Airpark (15FL), Lake City, Florida. The private pilot and two passengers were seriously injured, and one passenger sustained minor injuries. Visual meteorological conditions prevailed, and no flight plan was filed for the local flight. The personal flight was conducted under the provisions of Title 14 Code of Federal Regulations Part 91. The right front seat passenger stated that as soon as they took off, he knew something was wrong because the airplane was not climbing very fast. He thought the airplane was going to touch back down on the runway when he noticed the airplane's nose going "up and down." The airplane made several nose-up and nose-down oscillations before going past the left side of the runway and contacting tree tops. The airplane then impacted the ground and cartwheeled. A witness who was parked on the side of the runway to watch the airplane takeoff, stated he observed the pilot perform a preflight engine run-up and the airplane begin its departure on runway 27, a 2,600 ft-long runway. The wind was a right quartering tailwind about 8 to 10 mph. He thought the pilot "forced" the airplane off the ground and it immediately began "oscillations;" when the airplane appeared to be near stall speed, the nose lowered and would then raise again, which repeated until the airplane contacted tree tops. He further stated that each time the airplane oscillated, it resulted in a lower altitude. Examination of the wreckage by a Federal Aviation Administration (FAA) inspector revealed that the airplane's wings sustained buckling and tears. The left main landing gear collapsed. The fuselage had buckling along its length aft to the elevator. The rudder was undamaged. The four seat, low-wing, tricycle gear airplane, was manufactured in 1989. It was powered by a Lycoming IO-360 series, 200-horsepower engine, equipped with a two-bladed McCauley propeller. The pilot held a private pilot certificate, with ratings for airplane single-engine land and instrument airplane. His FAA third class medical certificate was issued on August 20, 2015. He reported 3,583 total hours of flight experience at that time. First responders on Sunday afternoon cordoned off the grass runway at Cannon Creek Airpark after a plane belonging to residents of the aviation-focused community crashed into a tree during takeoff, according to the Federal Aviation Administration. The plane, a single-engine Piper PA-28R-201, is registered to William and Susan Lagoni of Southwest Challenger Lane. Four people were onboard when the aircraft crashed around 2 p.m. in the aviation community, which sits off Sisters Welcome Road, according to an FAA spokesperson. Multiple neighborhood residents confirmed the husband and wife were both aboard the plane with two other passengers. FAA is investigating and the National Transportation Safety Board will make a determination as to the cause of the crash. One source close to the couple said the third and fourth passengers were a man and his young daughter. Several onlookers at the scene Sunday afternoon said the pilot and passengers were airlifted to a Gainesville hospital. The plane was about halfway down the runway when it crashed, the source close to the couple said. Columbia County deputies and emergency medics taped off the crash site before community residents circled around. The unidentified adult male passenger was visiting from Indiana, said several people at the scene. 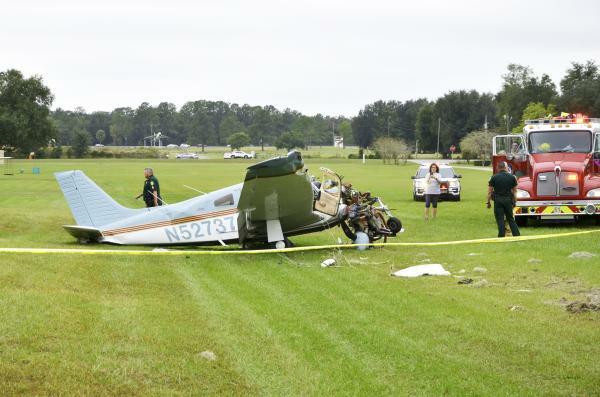 LAKE CITY, Florida - A small plane crashed in Cannon Creek Airpark in Lake City on Sunday afternoon, according to the Columbia County Sheriff's Office. Officials said four people were on board. Fire and Rescue crews said all four were alert and talking after the crash. Fire Rescue officials said they were flown to the trauma center in Gainesville as a precaution and the extent of the injuries they suffered is unknown. No one on the ground was hurt. Is that 25 or 40 degrees set on the flaps? I can't tell. 90 degrees would be pointing straight down so I'm going with 40 degrees. If he was in fact taking off and not landing you never use full flap. It's amazing from the amount of damage to the cockpit area that we're not hearing of fatalities. How much ever it is it looks like more than 1 notch. Lol ... I botched that. Thanks for the 'out' ... May the plane RIP ... May the pilot and pax achieve a quick and full recovery. Evert time one of these legacy aircraft are destroyed, general aviation as we know it comes closer to an end. Sad ending for a fine plane. My favorite Warrior II N9097U met a similar fate. Hope everyone make a full recovery.